Will they ever go away? It seems much worse this year than ever before and with the mild winter; did they ever hibernate? Most individuals will say, "No". Feeding runways were observed being pushed up even under what snow we did get. As long as the soil remains wet and unfrozen, we will see activity. Many turfgrass managers, gardeners and homeowners feel that the presence of moles is due to the presence of white grubs. 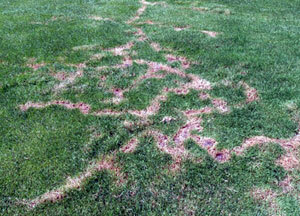 Their first reaction is to apply a grub insecticide when mole activity begins in spring. While moles do feed on white grubs, grubs are not present at this time of year (late winter to early spring). Their primary food source is earthworms and many grub insecticides applied now, are known to reduce beneficial earthworm populations up to 70%. 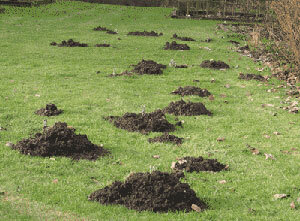 Mole activity decreases due only to the depletion of their primary food source, so they leave the area. In time, earthworms and moles will return. Therefore, grub insecticides should not be used for mole control. 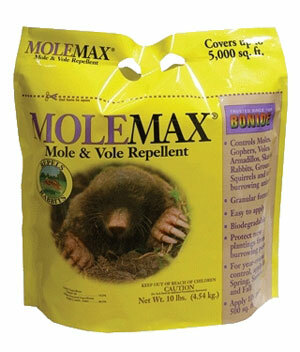 Most people have never seen a mole; however they are well aware of the damage caused to lawns and ornamental beds. Mounds of soil (molehills) and surface tunnels (feeding runways) are the common signs of mole presence. Learning to use repellents, traps, and baits and making use of a broom handle or similar stick can greatly reduce mole activity in as little as three hours. 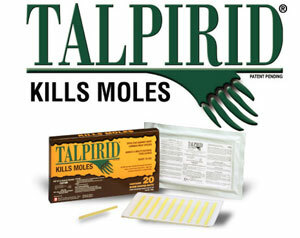 The following information will provide you the most efficient methods of mole control. Moles live most of their life underground and are highly specialized animals for their subterranean way of life. 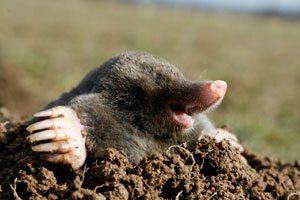 The Eastern Mole is a small, sturdy animal, 5 ½ to 8 inches long, with a somewhat cylindrical body and elongated head. The Eastern Mole is grayish-brown on the back to pale or more brown on the belly. Their velvety fur often has a silvery sheen. Occasionally bright orange or cinnamon-yellow marking will occur. Their fleshy snout serves as a highly sensitive organ of touch and smell to seek out numerous food sources. Their tiny eyes are concealed in fur and covered by fused eyelids; sight is limited to distinguishing light from dark. The greatly enlarged front feet are normally held with the soles vertical and pointing outward. They possess well-developed claws that have a specialized bone attached to the wrist, which aids in digging. Moles construct networks of tunnels in the soil surface. Many of these are built after rains when the mole is in search of new sources of food and are usually not re-used from day to day. Digging of surface tunnels normally proceeds at a rate of 1 foot per minute. They tend to feed and rest on two-hour cycles, 24 hours a day. They are carnivores and living organisms constitute about 85 percent of their diet. This includes earthworms (their main source of water) and grubs, primarily; however millipedes, centipedes, spiders, sow bugs, snails and slugs are taken in considerable amounts. Moles are insatiable eaters and can consume 70 to 80 percent of their body weight daily. Moles generally move up or down within the soil profile to follow food sources such as earthworms, which move with soil moisture. Moles also create mounds (called molehills) of soil in the lawn by pushing up soil developing deeper, permanent tunnels and nesting cavities. Mating occurs in the spring with a single annual litter of 2 to 5 young being produced in March, April or the first week of May. High infestations consist of 2 to 3 moles per acre. Repellents usually contain castor bean oil as the active ingredient. Repellents need to be applied on a regular basis as a spray or granular application. They can be effective if application rates, frequency and techniques are strictly followed according to the label. 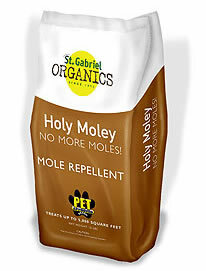 Several brands of mole repellents include Chase, Liquid Fence, Molemax, Mole Out, Mole Scram, and Scoot Mole. Use of a broom handle or similar stick to poke holes through the top of feeding tunnels at random throughout the tunnel network. Re-visit those holes in two to three hours and inspect. A hole re-plugged with soil indicates a mole passed through that feeding tunnel making it an active feeding tunnel for that day. Not all feeding tunnels are used daily. 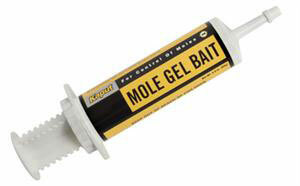 Set traps on or insert baits into active feeding tunnels. Use rubber gloves to set traps or insert baits to reduce human scent. Continue to trap and bait until activity ceases. 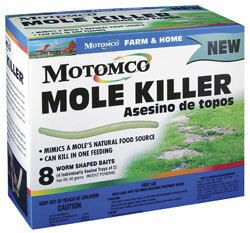 Controlling a few moles in an average size lawn (5000 square feet) will greatly reduce mole activity. 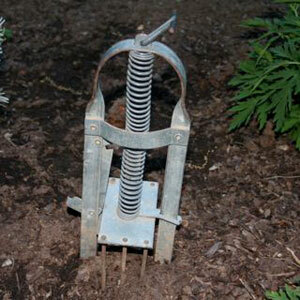 Effective traps include the "Easy Set" Mole Eliminator scissor trap, the "Victor" and "Sweeney" harpoon traps, and the "Nash" hoop trap. Available baits include Kaput Mole Control (syringe applicator), Moletox Baited Gel (syringe applicator), Talpirid (earthworm shaped bait), Motomco Mole Bait (earthworm and grub shaped baits), and TomCat Mole Killer (earthworm and grub shaped baits). Baits can be up to 95% effective if used correctly. Always wear latex gloves when handling traps and bait to avoid human scent contamination. Keep in mind that moles are a perennial problem. When a void in the carrying capacity (number of moles a given areas can support) of a given area is realized, more moles will move in searching for earthworms and other insects. 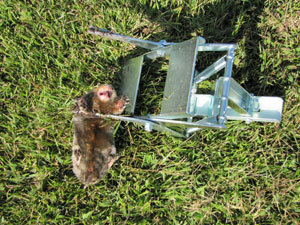 For this reason, trapping is the most economical method of mole control.